No Man’s Sky is, first and foremost, a game of deep space exploration. Developer Hello Games and its founder, Sean Murray, rarely lead with that, because it’s dangerous to give the impression that it’s all ambience and no gameplay. No Man’s Sky has space combat, mining, trading, an economy by way of space stations, multiplayer, and progression fueled by the lure of suit upgrades and new ships—and you can engage with all of these things, or none of them. That’s what has made the game so difficult to explain, as Murray told Digital Trends at 2014’s PlayStation Experience. When it opens, No Man’s Sky spawns you on a random planet toward the edge of the universe. There are so many planets in the game’s galaxy that it would take hundreds of billions of years to explore them all—that’s a claim that Hello has thrown around a lot—and when you start the game, you can end up on basically any of them. No one knows what that planet will look like, or what you might find there, not even Hello. There are no tutorials. You walk around, try the controls, and find your ship nearby. Then, once you’re done wandering, you fly out into space. Each planet is a new opportunity to whip out your resource scanner and check what’s in the terrain, then mine for goodies with lasers and grenades. 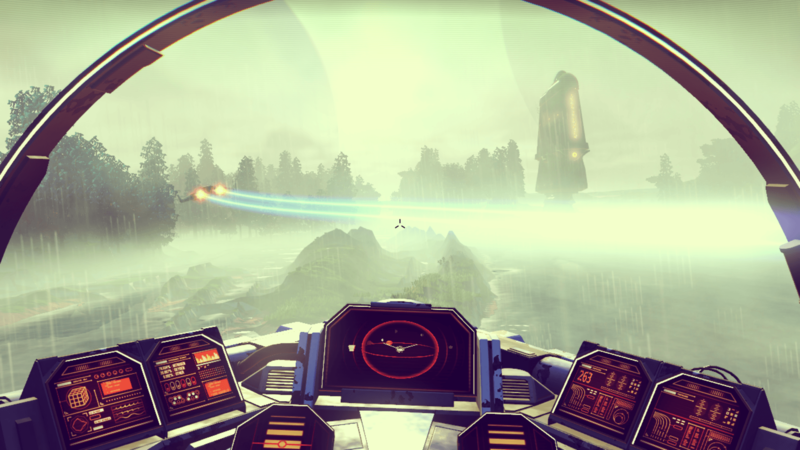 Make no mistake: No Man’s Sky is a video game. You have a sprint button and a jetpack, and if you die you lose whatever you’re carrying—or even your ship, if it’s destroyed in battle. If that happens, you’d better hope you have enough credits to buy a new one. Cause and effect mean something in No Man’s Sky, and consequences are everywhere. If you’re the first player to discover a body of water or a system of caves, you can decide what to name it and upload your findings for other players to see. Or you can keep that info to yourself, a private oasis or treasure trove that no one else is likely to find thanks to the game’s sheer enormity. An example from Murray: Say you touch down an a brand new planet and spy some resources at the bottom of the ocean. You’d like to grab them so you can upgrade your ship’s hyper drive and explore yet more planets, but the ocean’s liquid is toxic and will kill you if you just dive in. So you note the coordinates and continue on your way, returning later—sometimes much later—when you’ve upgraded your suit with the right protections. All of this represents a story that you’ve authored all by yourself; and no one else can know precisely what it felt like to finally return and claim that specific prize. It was apparent enough in Murray’s live demo, in which he touched down on one of the game’s quintillions of planets at random. That’s something Hello has never done publicly, despite having had several opportunities during E3 and other big events. Murray doesn’t know what he’ll find, and that’s a risky way to debut a game in front of such big crowds. Even in private, Murray admitted he was nervous as his ship breached the planet’s atmosphere. Its surface was suffused with endless green, rolling hills, interrupted by towering black alien monoliths that dotted the landscape. Huge chunks of earth floated in the sky overhead, like clouds. Murray had never seen one like this before. “The weirdness of that never escapes me,” he confessed. One of the most revolutionary things about No Man’s Sky is something that most people won’t even pick up on. “It sounds ridiculous, but we’ll probably be one of the first games without a skybox,” Murray explained, referring to the 2D images of clouds and stars that hover over the majority of video game worlds. “Only a gamer knows what that means, you know? But it’s significant because those stars, when I was flying through space, you can see those stars and they’re real places [you can visit]. ”Gamers have been asking for bigger environments, more options, better writing, prettier graphics, and a million other things for as long as there have been games. But based on what we’ve seen of No Man’s Sky it seems “death to the skybox!” is what we should have been chanting all along. Those are not great odds for players hoping to discover something incredible and not just another barren planet waiting to be strip-mined for resources. One can easily imagine databases, forums, and Reddit communities cataloguing this universe, planet by planet. Players collaborating online as pioneers, crowdsourcing the act of discovery, sticking a virtual bookmark anywhere there’s something interesting to see. But that won’t necessarily happen either, Murray explained, thanks again to the game’s absurd size. “You’ve got quite a journey to go to a specific point,” he said, meaning even if you know the coordinates of the space dinosaurs or some strange monument, you probably couldn’t get there quickly. And by the time you do, another player may well have lasered those awesome beasts into extinction, or leveled those incredible ruins, because yes, that’s possible too. It sounds like a harsh environment, and it may be that some players come away from No Man’s Sky having never discovered anything of note and wishing they hadn’t wasted their time and money. But like the vast star field he’s worked to create, Murray doesn’t care. “As much as we can possibly manage, this needs to feel real, and true to what it is, which is a galaxy,” he said. No Man’s Sky may or may not have a story. That’s for players to figure out. Murray questioned whether anyone really wants to know at this point, anyway.